With my plan to try and make a VTail quad and the difficult nature of getting model making stuff at a sane price here in NZ, I decided to try and make some fiberglass sheet for quad body plates. Since I already had the fiberglass resin and some chopped matt from my other "Summer" project I just used that. 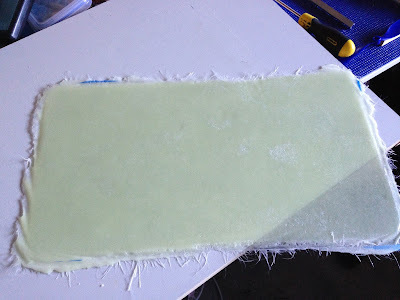 Im sure if I went and got mesh I could make thinner and lighter sheets, but for this first test i used chopped matt, and I didnt want to spend any more $$ until I can prove I could make fiberglass sheets. I had a old beach cut off that was cover in formica (hard flat surface) and a toughened glass panel from an old computer desk. 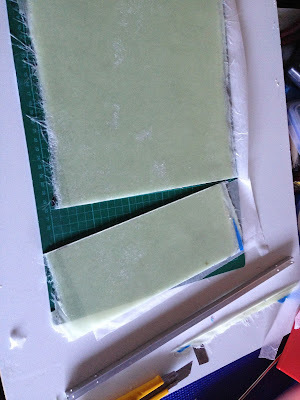 Next I worked out the workable size and then masked it off with Waxed paper. Each side had he waxed paper taped down. The waxed paper is used as a cheap release agent. The next step was to cut some the chopped matt to fit inside of my defined working area. I then mixed up the resin and layed down the first layer of resin and wetted out the layers of matt. This is three layers of 1mm chopped matt wetted out and fully rolled with a fibreglass roller. Next I placed the glass sheet on top and then walked over it all to apply pressure and hopefully get a condensed flat sheet and smooth surfaces on both sides. I then put some very heavy item on it and left it overnight in a cold garage. 24hrs later I carefully split the glass off. This was tricky and required patience and I was really nervous that it would have bonded together, but it popped apart pretty easily and I was really happy with the finish. There were some areas where is wasn't fully wetted out and there was some exposed fibre. But overall really happy with the result. Next was to get it off the base board. It popped off the base easily due to the waxed paper. There was some seepage. Next time I would use two layers of paper. The picture below shows the sheet fully realised. Since it was still not fully cured due to the cold I was able to cut with a craft knife. It took about 10 passes to cut fully through the sheet. I spent about 30-40mins cutting out various sized plates from the sheet. The plate sizes I cut are guesses on what I think I might need. 110x110mm, down to 65x65mm. The ones for the Vtail is 65x120mm. I hope my estimates are correct. Overall it was a fairly easy process. But that is due to my previous learning on the TBucket and having the materials. It may not be cost effective if you had to go and buy all the materials. It will be interesting to see what strength the plates have once fully cure.